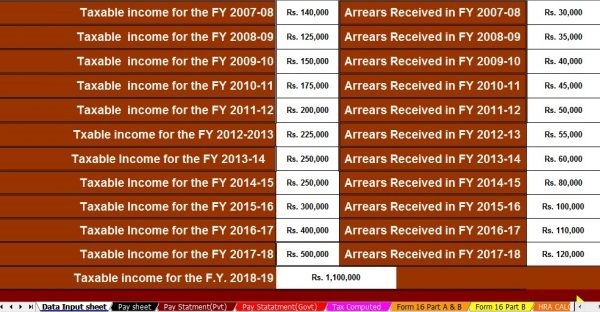 Whereby any portion of assessee’s salary is received in arrears or in advance or by reason of his having received in any one financial year salary for more than 12 months or payment which under the provisions of section 17(3) is a profit in lieu of salary, he is hence taxed at a higher slab than that at which it would otherwise have been assessed. The Assessing Officer shall, on an Application made to him, grant such relief as prescribed. The Procedure for computing the relief is given in Rule 21. This relief is provided in the financial year in which such arrears have been received. The Difference between 1 & 2 is the tax on additional salary Included in total Income. Calculate the difference between 4 & 5 for every previous year to which the additional salary relates & aggregates them. The Admissible Relief shall be the Excess between the tax on Additional salary as calculated under STEP 1 & STEP 2. In respect of any amount received or receivable by an assessee on his voluntary retirement or termination of his service in accordance with any scheme, the assessee has claimed exemption u/s 10(10C) in respect of such compensation received on voluntary retirement in the same assessment year or any other assessment year. may furnish the particulars to his employer who is responsible for making the payment referred to in section 192(1) in specified form 10E. In the case of other employees, the application for relief shall have to be made to the Assessing Officer instead of Employer. Tax calculation in Current f .year is wrong….